Starting server virtualization is always a difficult task to begin with. First thing you need to deside is which servers you want to virtualize (Well some pointers in that direction : all of them!). But with all difficult tasks you need to take a structured approach. Business isn’t waiting for you to bring down their critical applications. Therefor approach it one step at a time. This gives you the structured approach you need, slowly entering the learning curve of virtualization and giving your IT department the time to adapt to all virtualization technologies. I would always advice to use a capacity planning tool for your “physical” server environmen, before beginning to start server virtualization. Tools like VMware Capacity Planner and Novell Platespin PowerRecon give you a good insight in what the workloads are on your physical servers. This will then be presented to you in a report with an advice for the most optimal virtual workload distribution across your “yet to be build” virtual infrastructure. Besides these technical tools, you can also use SCOPE. A conceptual tool by Danielle Ruest and Nelson Ruest. 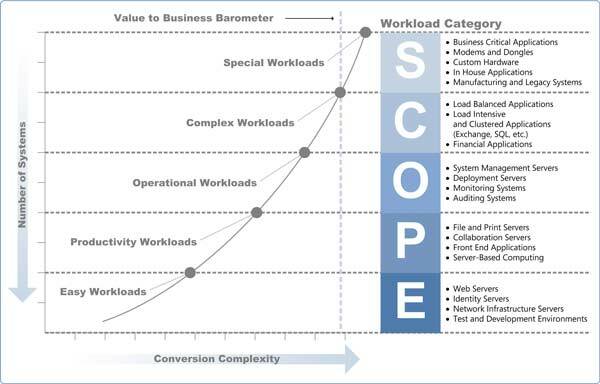 SCOPE lets you quickly identify which workloads to start with. Begin in the lab, maybe even with the lab machines themselves, and slowly move your virtual workloads into production. Easy workloads; Servers that don’t consume a large workload and can be easily virtualized. Complex workloads; Server that are, already without virtualization, complex to maintain. These includes the servers which have common applications installed on them in mostly enabled with clustering / load balancing. Special workload; Each IT infrastructue has those servers which require special attention. When finishing the virtualization of your complete IT infrastructure, these servers will finish the job. So as you can see, SCOPE gives you a five step approach to virtualizing your IT infrastructure. This will hopefully help you in creating a good virtualization strategy!